Ever since its initial release as a launch title on the GameCube, Luigi's Mansion has been one of Nintendo's most original and charming entries below the Mario banner. 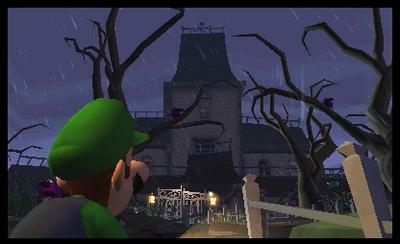 Unlike any other game in the series, Luigi's Mansion presented a playful combination of simple scares, exploration and tough puzzling. Hopefully, that winning formula will repeat in the first full sequel to the game that's coming to the Nintendo 3DS. New to the formula, though, is the now official multiplayer arm of the experience. Luigi's Mansion: Dark Moon will include local and online multiplayer. The Hunter Mode is featured in the trailer above, and tasks players from around the world with teaming up and clearing one floor of the ScareScraper at a time. Luigi's Mansion: Dark Moon is slated to release exclusively for the Nintendo 3DS on March 24th, 2013. Will you be picking it up? Nintendo has revealed new information about Luigi's Mansion: Dark Moon launching exclusively for the Nintendo 3DS family of systems on March 24. Luigi stumbles through multiple mansions to capture ghosts and solve puzzles armed with his trusty ghost-catching vacuum cleaner, the Poltergust 5000, and in a series first, the game will feature local and online multiplayer modes, as well as Download Play capabilities. Join up with up to four players and journey into the ScareScraper, which is jam-packed with paranormal creatures. Additional systems and games may be required for multiplayer modes and are sold separately. In Hunter Mode, each player controls a different color Luigi and is challenged to hunt down ghosts and use effective teamwork to clear each floor of the tower before the clock strikes zero. Bonuses and upgrades can be earned depending on how well the team performs. There are also boss battles at the top of each tower. Players can choose the number of floors in this mode ranging from five, 10 or 25. They can adjust the difficulty to cater to both new and veteran gamers. Fallen players can even be revived by their teammates to keep the adventure going. When Luigi's Mansion: Dark Moon launches on March 24, shoppers can purchase the packaged game as usual at retail locations nationwide. Or they can simply purchase and download the game on their own from the Nintendo eShop using a wireless broadband connection. Regardless of their purchasing method, the game sells for a suggested retail price of $39.99. For more information about Luigi's Mansion: Dark Moon, visit http://luigismansion.nintendo.com.